ATLANTA, Georgia (CNN) -- Ask Steve "Lips" Kudlow how his band, Anvil, overcame bad management, a dead colleague, cruddy jobs, unpaid tour bills, raging arguments and now mockery as a Spinal Tap clone, and he has one word: "kismet." Robb Reiner and Steve "Lips" Kudlow have never given up on playing rock 'n' roll. When Sacha Gervasi, a former teenage Anvil fan-roadie turned Steven Spielberg scriptwriter ("The Terminal"), decided to pursue a documentary about his old heroes, guitarist Kudlow was working part-time in his native Toronto, Ontario, delivering meals to schools. Drummer Robb Reiner was doing demolition work nearby. 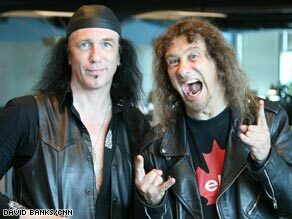 Anvil still played, but it was a far cry from the mid-'80s, when the band did a Japanese show with Whitesnake, Bon Jovi and the Scorpions and became a model for groups such as Metallica and Anthrax -- bands that had far more success than Anvil. The result is a documentary, "Anvil! The Story of Anvil," that's earned rave reviews, is gradually rolling out across the country -- and has reawakened interest in Anvil. "It's better than most music documentaries. It's better than most documentaries, period," he wrote after seeing the film at the 2008 Sundance Film Festival. "I am about as metal as your aunt, and I was spellbound by 'Anvil! The Story of Anvil.' ... [It's] a hymn to the human spirit, played loud in power chords." The enthusiastic Kudlow and laconic Reiner came by CNN Center to talk about the film, their inspirations and why they've always been successful. The following is an edited version of the interview. CNN: What was the reaction when Sacha came to you and said he wanted to do a documentary on Anvil? Steve "Lips" Kudlow: I started crying, because it seemed like kismet, as if it was all meant to be this way. And quite honestly, it is. My internal optimism told me this is going to be the most successful thing that's ever happened to me, and perhaps one of the greatest things that's happened to rock music -- the greatest rock documentary that's ever happened. Robb Reiner: My initial reaction was that this was going to be cool, but I wasn't really sure if anybody would care. After Sundance, I knew that this thing was going to be very successful. ... [It got] standing ovations. At that point, I knew something was coming. CNN: The film, fairly or unfairly, has been presented as a real-life "Spinal Tap." Is that fair? Kudlow: It was purposely done. Reiner: It's fair. What can you say? We're a heavy metal band. My name is Robb Reiner. [The director] is the other Rob Reiner, and Spinal Tap is the fake Anvil. But, outside of that ... it was a Trojan horse to lead people into this. Realistically, we're not like Spinal Tap, and the movie's nothing like it either. It's a spin that's been created by the media, and we've just been having fun with it. CNN: A lot of times when a director sets out to make a documentary, the people who are in the documentary say, "You cut this out, you changed this." It's like a reality show. Did Sacha do this, or is it pretty much what you see is what happened? Kudlow: It's pretty much what you see is what happened. Reiner: They shot 320 hours of footage. The whole movie is a one-take movie. They just filmed everything ... they could have made five different movies out of the footage they had. Reiner: Well, maybe three and a half. Kudlow: It might have been five more-boring movies. CNN: What was the first record you heard that said, this is the direction I want to go? CNN: There's that funny bit in the movie in which you [Lips] talk about meeting Reiner by observing, "I heard this guy playing Cactus." And then later you met [Cactus drummer] Carmine Appice. Reiner: It's like foreshadowing there. Kudlow: And how do you get foreshadowing in a documentary? You don't. It's just that's the way things played themselves out. That's what I mean by kismet. It's as if the screenwriting were done by God. The stuff fell into place by itself. CNN: It's easy to make fun of a band -- or make a tragedy out of a band -- that doesn't quite make it. But back in the '80s, you were playing in front of tens of thousands of people. Even if it had ended then, you say in the movie that you've had the kind of success you were always hoping for. Reiner: We've been successful a lot as far as we're concerned. Kudlow: We've recorded 13 albums. Reiner: We've been touring for 30 years. Reiner: The music got us here. There would be no movie if the music didn't mean anything, or hadn't meant something. Kudlow: You wouldn't get testimonials from some of these people if the music didn't mean something. We did make a difference. We were an influence. And we've always known that. And part of that is the fuel. CNN: Are you tying in concerts with the movie? Reiner: It's called the Anvil Experience. We show the movie and we play right after, in the theater. We've been doing that for the last two months throughout America, and it's like metal Beatlemania. Reiner: "Juggernaut of Justice" is our next album. It's written, and we're just going to record at the end of the year and release it next year. We were going to keep rocking whether this movie came along or not. This movie is a rocket launcher to the mainstream, and here we are.